Ticket To Ride Pocket is the iPhone implementation of the popular Ticket To Ride board game. It is important to point out that this is an iPhone/iPod Touch specific version and is not optimized for iPad; there is a separate iPad version if that is your hardware of choice. Ticket To Ride Pocket can currently be bought for $1.99 but has been seen before for $0.99 and even free. Within the app you can also acquire the Ticket To Ride USA 1910 expansion for $0.99. A route between two cities will be of a specific color (among 8) or grey, and will have a specific length. To claim a route you will need as many train cards of the specific colors as the length of the route. For grey routes you can use any color train cards, but all must be of the same color. There are also wildcard trains (locomotives) that can be used as any color. Each time you claim a route between two cities, depending on the length of the route, you get victory points (2 for length 2, 15 for length 6 for example). When you claim a route, you discard the required amount of train cards and place the required amount of train tokens on the map to show that the route has been claimed. At the beginning of the game each player will also have to choose a minimum of 2 out of 3 destination cards. Each of those represent two cities and a number of points: if at the end of the game the two cities can be linked by the routes claimed by the player, he will score the points, if not they will be deducted form his total points. Trains cards (colored and wildcards) are randomized in a draw pile and the top 5 are revealed. When acquiring train cards, the player can either chose two colored train cards, two cards from the top of the draw pile, one colored card and one from the top of the draw pile, or one locomotive. Using the draw pile gives you the chance to get locomotives while still drawing a total of two cards. The app gives you many options to play a game of Ticket To Ride. Online using Game Center you can play against a mix of friends and random opponents. I have not played enough random opponents to give a statistically relevant comment on game activity, but the few times I played against 1 or 2 random opponents, there was not much wait for the game to start. The implementation of the game on the small screen is as good as it could be. The graphics and menu are beautifully matching the theme of the game and the user interface is intuitive: it is easy to see what is going on on the board and even easier to play your turn. As stated in the introduction, this is an iPhone/iPod Touch only game and there is a separete iPad version as well as an iPhone version of Ticket To Ride Europe. A short version of the verdict would be: a great app of a great game. Now for the app, this is a nearly perfect implementation; the graphics are great, the interface is easy to use and you can play in many different ways. The issues I have with it are the lack of Universal Support (you will need to buy the game twice if you want to play on both iPhone and iPad) and the fact that there are no expansion maps (you need a separate app to play Ticket To Ride Europe). This last point is not a big issue but I find it more convenient to have all my Ticket To Ride needs in one app. I highly recommend this app to anyone; newbies who want to discover Ticket To Ride (especially at the low price of this iPhone version) or gamers already fan of the game. However, if you are a gamer fan of the game and have an iPad, if you have to choose one, I would recommend the iPad version (see upcoming review of the iPad Version for more details). This is the digital iOS implementation of the popular tiles laying game Carcassonne. The tabletop version of the game is from Rio Grande Game while the app has been developed by TheCodingMonkeys. The app is Universal (same purchase will work on both iPhone and iPad) and can currently be downloaded for $9.99. Through the app you can also purchase a couple of expansions: River ($0.99) and Inns And Cathedrals ($1.99). It seems a little pointless to explain the rules or gameplay of Carcassonne as all of you here must know about it. But for the few people that were hiding under a rock for the past 12 years, here is a quick explanation of the game. The game consists of 72 tiles with different combinations of Roads, City walls, Fields and Cloisters on them (24 different tile designs). The players will then draw a tile and place it on the board so that its sides match the adjacent tiles. The classic game of Carcassonne faces off 2 to 5 players. In this set-up each turn each player will draw one tile and place it on the board. Each player will also start the game with 7 followers (Meeples) who are key to actually score points. Placing tiles on the board does not score any point, but each time a player places a tile, should he have any Meeple left, he can place one on that tile on either the Road, the City, the Cloister or the Field. Then, if the Road completes (there is a crossing or a City at each end), the City completes (the City is surrounded by walls with no gap) or the Cloister completes (the Cloister tile is surrounded by 8 tiles), the player with more Meeples on it will score points and all Meeples on the given Road/City/Cloister will go back to their players. Meeples on Fields cannot be recovered during play and will score only at the end of the game depending on the number of completed Cities it borders. Note that you cannot place a Meeple on a Road, City or Field already occupied, but two Roads, Cities or Fields occupied by different players might join on subsequent turns in the game in which case, when scoring occurs, the player with the most followers on it will score. On game end, unfinished Roads, Cities and Cloisters will also score points. And talking about the game ending, this happens when the last tile in the draw pile is placed on the board. In the digital version of Carcossonne, there is also a solitaire game. The basic tile laying rules are identical to the classic multiplayer version, but the goal is to build Roads and Cities of sizes 2 to at least 6 in consecutive increasing sizes within an area as small as possible. The game ends when this is completed or when the 72 tiles are exhausted. You score points for completed Cities and Roads of increasing sizes but points are deducted for each tile placed and when you increase the size of the square your tiles fit in. Note that in this solo version the tiles are not randomized but ordered depending on presets scenarios. The expansions give you few more tile types to play with (Inns, Rivers and Cathedrals) which change the way you place tiles (River tiles are placed at the beginning to the game) and the scoring mechanics (Roads with Inns and Cities with Cathedrals are worth more points when completed, but none if incomplete at the end). The Inns and Cathedral expansion also gives each player a double follower which is played like all normal followers but is worth double when deciding who scores points. The app gives you many options to play a game of Carcassonne. As describe above, there is the solitaire game that you can play to compete on the leaderboards (via Game Center). Then, for the classic multiplayer Carcassonne, you can play 2-5 players games. You can do so alone against multiple AI, pass and play mixing AI and human players or asynchronous online using Game Center. Online you can choose to invite friends or go for a random game. The few times I tried random games I found willing opponents quite quickly.There are 5 levels of AI that would probably be of adequate challenge for most players. To learn the game for both solitaire and multiplayer set-ups there is an interactive tutorial that can be supplemented by an easy to read rulebook. The design of the app is clean and simple yet pleasing and goes well with the theme (building a medieval countryside town) and design of the original game. All the assets can easily be seen on the screen and with zooming capabilities the game is easily playable on both iPhone and iPad. The digital version of Carcassonne is the first “modern” board game I played when it came out on Xbox and showed me that there is more to board games then Monopoly, Yahtzee and Scrabbles; so it has a special place in my heart. Yet, trying to be objective, the digital version of Carcassonne on iOS is a great game. Carcassonne the game is an easy to learn (especially that in its digital form, scoring is automated) hard to master kind of game. The classic multiplayer game is a good mix of luck, strategy and player interaction. Some games can be brutal as each player tries to block the others, but you can easily adapt your play when playing with kids or your significant other. The solitaire game can be interesting but I have to say than if you want to play alone, I have more fun playing against the AI than the solo games. 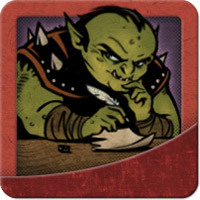 The iOS conversion of the game is an example of how a board game can be implemented on a portable device. The app is clean (especially on Retina devices), pretty and simple to use, yet it offers a lot of options to always be able to play a game alone or with others. I recommend this game to anyone with an iOS device. The game is Universal (same app works on both iPhone and iPad) and is currently priced at $3.99. In Food Fight 2 to 4 players battle to be the first one get 10 victory points (VP) at which point the game finishes and that player with 10 or more VP is declared the winner. The players will engage in as many battles (rounds) as required for one to reach 10 VP. The battles take place on battlefields (meals; breakfast, lunch or dinner) and depending on the number of players, for each battle 2 or 3 meals will be drawn. Each meal is worth a different number of VP and the winner of the meal gets those VP. For each battle each player will have 9 cards. Depending on the settings those can be random or drafted (player chooses 1 card out of 9 and passes the 8 remaining cards to the next player, gets 8 cards from the previous player and chooses one and passes the 7 remaining cards to the next player and so on until each player has 9 cards). Those cards will (or should) be a mix of Troops and Instants. Each player then chooses 5 Troops to fight for him and keeps the remaining cards in his hand. Each player will then select which meal to fight at. If two or more players selected the same meal, they will fight to gain the VP of that meal. If a player is alone to select a meal, he will fight against the dog; basically a special shuffled deck of cards that will be drawn to fight you. For a fight, the 5 Troops selected will be randomized and the top card for each player will be shown. Each Troop has a Yumminess value and the player with the most Yumminess will win a Mint Point (MP). Before deciding the winner of this turn (serving) the players can also decide to play Instants that can add more Yumminess to your card. Note that Troops can also have actions/effects that can influence their Yumminess or the Yumminess of cards played after it in the fight. Once the MP has been attributed, the players reveal the second Troop of their deck, compare their Yumminess and play Instants and so on until all the Troops (5) of each player have been played. At that point the player with the most MP is declared the winner of the meal and will get all its VP. Troops have factions (breakfast, lunch or dinner) which have two impacts: cards of the same faction usually play better together as their actions can often impact only cards from the same faction; ties are broken in favor of the cards of the same faction as the meal being fought at. Note that any card from any faction can however be played at any meal. Fighting the dog is similar to fighting a player but the cards the dog plays are different, he does not play Instants and he looses all ties. There is lot of randomness in this game as the cards you play with are random or semi random (drafted) and the one you select for a fight are then randomized. The decisions to make are thus limited to drafting, selecting the cards that will be played (but not their order) and when to play Instants. The game lets you play 2-4 players games. You can play alone against multiple AI (3 difficulty levels), pass and play mixing AI and human players or asynchronous online using Game Center. There is not much activity online and it might be difficult to find a game to play, especially without too much wait. To learn the game there is an interactive tutorial that you can supplement by accessing the rulebook. A positive point again for Playdek is that unlike some other iOS implementation of board games, the rules have been adapted to the digital game and are not a scan of the board game version. The design of the app is inspired by the fun theme and cards of the game with drawn backgrounds and fun animations. The main complain about the implementation is that the graphics are not Retina enabled, so even on a newer iPad you will need to zoom in the cards to read them. As an app, it is a beautiful conversion of the board game with a nice design, fun interface, easy ways to learn the game and different options to play alone or with other players. The main complain about the app itself is the lack of Retina support which for me is kind of a deal breaker. Then there is also the lack of online activity which can reduce the replayability. As a game, well, I do not care for it at all. There is too much luck involved and you cannot develop any real strategy or tactic. The tree version of the game might be fun as there is interaction with other players, but as a video game, it is not engaging enough. I feel like this is a missed opportunity as the theme and the art are fun and maybe a house rule for the tabletop version allowing you to order your troops instead of randomize them could make it better. I really cannot recommend this app except maybe for people who are fan of the original game and want a fix on the road. The game is Universal (same app works on both iPhone and iPad) and is currently priced at $4.99. As all well respected deck building games, all players start with identical decks they use to acquire more powerful cards. There are two currencies in the game, Runes and Power. Runes allow you to acquire Heroes and Constructs while Power help you fight Monsters. Each turn the player can acquire or defeat as many cards as possible given his Runes and Powers. Runes and Powers are obtained from Heroes you play and Construct you have in play (Constructs are cards that once played stay in play and give you some effect/action each turn). Powers are used to defeat Monsters, who in turn give you Honor points. Heroes and Constructs go on your discard pile once acquired but Monsters are banished (excluded) from play. Note that most cards give you additional benefits like drawing more cards, banishing card from play, extra Honor points,…. The goal of the game is to finish with more Honor points than your opponents; and the game finishes when the initial pool of Honor points available (depending on the number of players) is exhausted. In addition to the Honor points you get during play, at the end of the game you also get Honor points for cards in your deck as all card except the starting deck have a Honor value. Now one important point to explain is that unlike Dominion, Thunderstone, Nightfall, …,the cards you can acquire or defeat each turn are not always the same during a game. There are always two Heroes (one giving you two Powers, the other two Runes) and one Monster (giving you one Honor) that can be acquired or defeated. But all other Heroes, Monsters and Constructs are shuffled into a draw pile and at the beginning of the game the six top card are revealed and put in the center row; those, in addition to the three cards discussed above (2 Heroes, 1 Monster), will be the cards the first player can choose to acquire or defeat. Then, each time a card is taken from the center row, a new card from the draw pile is revealed to replace it. In addition to drawing your hand, this introduces an additional random factor. The interaction with other players is low to medium. Some cards you play make them discard cards in their hand or Constructs in play, others allow you to banish cards from the center row (if you can’t get a good card, better to banish it than someone else taking it) and a card allow you to steal few honor points from opponents. The game is fairly quick in its digital digital form, probably around 15 minutes against the AI and 10 minutes per player on multiplayer. The game lets you play 2-4 player games. You can play alone against multiple AI, pass and play mixing AI and human players or asynchronous online using Game Center. The AI offers 2 difficulty levels. Comparing my performance online (around 40% wins) to my performance against the AI (probably like 70% wins) I would say that for the better players, the AI might be too week. For me it is however fine as it gives some challenge while not being frustrating. To play online you can choose games with different number of players, using different sets of card (base set, base set plus expansions or expansion alone,…) and a timer. The timer lets you set how long each player will have to complete all of their turns, going from 10 minutes to 1 month. Note that it is easier to find 2 players games with 10 or 30 minutes timers. You can also invite people for private games. To learn the game there is an interactive tutorial that you can supplement by accessing the rulebook. A positive point is that unlike some other iOS implementation of board games, the rules have been adapted to the digital game and are not a scan of the board game version. The design of the app is inspired by the theme and cards of the game with drawn backgrounds and interesting music (each expansion gives access to a new background and a new music). The board is busy but the different areas are easy to differentiate and see. On the iPhone you will need to tap on cards to be able to read their actions or effects, but on the iPad, especially with a Retina display, all can be seen and read from the main view except the effects of constructs in play. Ascension delivers a quick deck building game experience perfect for portable play. Although the randomness of the center row (cards you can acquire or defeat) might put off some players, I do not think it reduces the importance of skills. In my experience good players will be much better at adapting to the changing cards and will usually beat less skilled players. The artwork on the cards has his detractors, but I am not one of them: this is for me the most interesting art I have seen on cards. The iOS implementation is also a winner with different options to play, a good tutorial, a clear board, nice graphics and animation and good music. There are however three improvements I would like to see: a stronger AI (although for me the challenge is fine as is); a chat for online play; a way to show the location or timezone of people as I have been caught playing with people obviously in opposite time zones leading to half day waits between each turns. I recommend the game to anyone with an iOS and it is a must buy for anyone interested in deck building owning a Retina display enabled iPad. As it is always a good strategy (in most if not all deck-building game) to keep a small deck allowing you to reach your most powerful cards as often as possible, if no banishing cards (the core of keeping your deck small) and draw cards (as explained in a previous post) are available for acquisition, Constructs are also a good choice as once played, they do not come back in your deck as they stay in play (except if an action is played forcing them to be destroyed). In Ascension there is no limit to the number of cards you can play, acquire or defeat and actions/effects you can use (unlike Dominion). As a game of Ascension can be quite quick, mixing “thinning the deck” cards with “draw more cards” cards can be a powerful strategy as it enables you to reliably get to the few more powerful cards you own. To find games to play online with little wait, look for 2 players games with 10 or 30 minutes timers. These are by far the most active set-up. If you want to play a 3 or 4 players games, it might be easier to create it and stick around in the app so people can see that you will respond soon if they join; and this is also valid if you join a 3-4 players games but more players are needed. And well, my GC profile is Sleepow, catch you online! My parents were visiting and I introduced them to modern board games: Tokaido, Takenoko and Roll Through The Ages. They enjoy all 3 and in the coming 10 days we will play some more of those plus San Juan and maybe Dominion. I am expecting in the mail Android Netrunner, Tokaido, EscapeThe Curse.. and Agricola Creatures Big and Small; so hopefully some of those. Not really a board game, but I will mostly explore the first decks available in the Solforge iPad demo. I have enjoyed it so far and there are a lot of strategies I have to try. This looks fun to play with a not really gamer wife, but does it play well for 2 players? Already played Takenoko; and will try to get my wife into something more meaty; probably Stone Age or Alien Frontiers. Did not get to play much last week as my only gaming partner was not motivated (my wife) so we will see if I can get lucky and play some Ascension and Takenoko. Already started with Dominion, and since we have been playing Takenoko nearly daily lately with my wife, a bit of that as well. I hope to make her try something new though, like LOTR LCG (little hopes though) or Mice And Mystics. My wife and I are addicted to Takenoko, so we played it 4 times yesterday.